About Nashville Dental Supply Company | NDI is family-owned | Nashville Dental Inc.
Family owned and operated since 1905. Now with 8 Service Centers to meet all your needs. 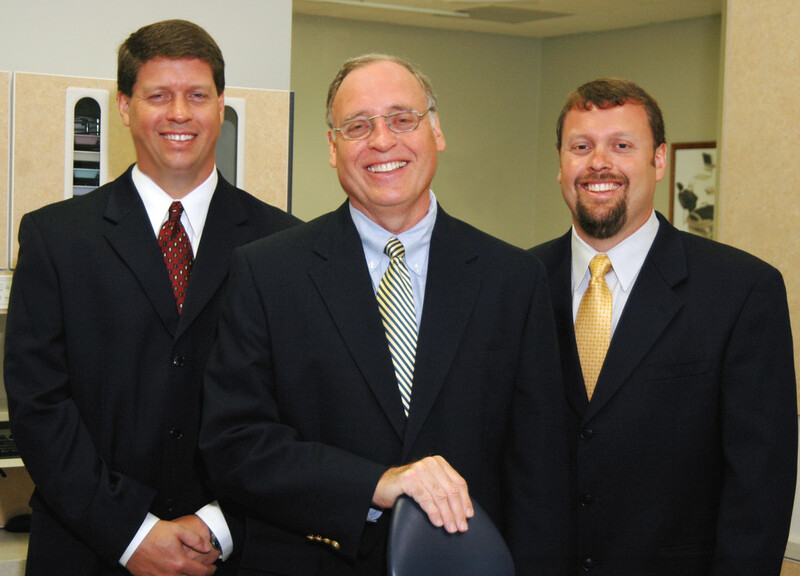 Nashville Dental has been family-owned and operated from day one of its long history. Founded in 1897 in Nashville, Tennessee, Morrison Brothers Dental Supply Company incorporated in 1905 and changed its name to Nashville Dental, Inc. Vernon L Brown joined the company in 1929 and began managing in the 30’s. He purchased the company outright in 1974. Mike Brown (center) became President of the company in 1981 and serves in that role today. Todd Brown (right of Mike) serves as Vice President, and Kirk Brown (left of Mike) serves as VP of Sales & Marketing. The company is currently in its third generation of management by the same family. Our team has a history of leadership in the industry, including two generations sitting on the board of the (ADTA/DTA) and holding the chair of the American Dental Trade Association (counterpart to the ADA). Nashville Dental, Inc. was actively involved in creating ADC (the American Dental Cooperative) and a charter member. ADC is a leading organization of full service independent dental distributors across the US which transitioned to NDC in recent years. 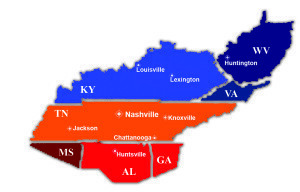 The only locally owned supplier in the region, NDI now brings comprehensive product choice to Tennessee, Kentucky, Alabama, north Georgia, north Mississippi, West Virginia, southwest Virginia and southern Indiana. Always MORE THAN A BOX OF SUPPLIES, NDI offers numerous products, services and solutions to support the local dental profession. NDI is passionate about the value the independent dental practices and groups bring our local communities. From improving overall health, to raising self-esteem, our customers improve the quality of life in our communities and offer a vital service. Nashville Dental is a partner for all stages of your practice’s life cycle. Whether you are a dental student preparing for graduation, an experienced dentist with an established practice, or a retiring dentist looking forward to your golden years, we can help you accomplish your goals. Our professional Account Representatives are trained to be a valued resource for our customers. Each account representative calls on 80-120 offices in your region, gleaning information and ideas about how different personalities and practice styles both succeed and struggle. Their job is to bring you the best information about products, services, solutions and ideas to fit YOUR personal goals for your practice and your unique personality. Learn More about the role of a professional account representative. can receive professional advice backed by more than a century of experience. Whether you are considering starting your own practice, becoming an associate, or buying an existing practice outright, put our expertise to work for you. We offer competitive startup financing, help evaluating and negotiating associateship agreements, and confidential assistance with selecting and valuing practices. can benefit from our comprehensive range of products and services. Our full line of supplies and the accompanying buying programs help you keep your practice successful and efficient. We offer flexible, open-source technology solutions to help you take advantage of today’s advances on your own terms. And our layout-and-design and competitive financing programs can help you expand or relocate your practice. can use Nashville Dental to help you reap the fruits of your years of labor. We will assist you in evaluating your practice as you prepare to sell.Through our extensive network of clients, we can also help you connect with a buyer. Whatever you need, wherever you are in your practice’s life cycle, choose a supplier with a unique combination of personal attention, stellar service, and competitive choice and pricing. Choose NDI. Learn More about the role of a NDI professional account representative. Contact us for more information or to request a visit from one of our professional account representatives.